Pulse echo method for nonlinear ultrasound measurement attracts the interest of the scientific community because it can be used for non destructive evaluation and in vivo measurement. Also, it can be useful in quantitative harmonic imaging. The technique is based on the measurement of the reflected harmonics from an interface separating two mediums. The use of this method for nonlinear ultrasound parameter measurement was suggested. However the mathematical model derived was based on the plane wave theory ignoring diffraction phenomenon. An analytical model taking into account diffraction is proposed in this paper. Using a decomposition of the source function in terms of Gaussian beams, analytical expressions are obtained for the fundamental and second harmonic reflected. For the experimental study a ring transducer is used for transmission allowing machining a tube to insert the hydrophone. The hydrophone is a PZT with 0.4 mm in diameter. The harmonics reflected from two interfaces (ethanol/water and water/glycerol) are measured. Comparing the measured values to the theoretical results allow to deduce the nonlinear parameter for water and ethanol. The results obtained agree with the value find in the literature and show the validity of the model. Сitation: Ahmed Chitnalah, Djilali Kourtiche, Hicham Jakjoud, Mustapha Nadi. Pulse echo method for nonlinear ultrasound parameter measurement. Electronic Journal “Technical Acoustics”, http://www.ejta.org, 2007, 13. 1. Dunn F., Law W. K., Frizell L. A. Nonlinear ultrasonic wave propagation in biological materials. Ultrasonics Symposium Proceeding, Chicago, USA, October 1981, 527–532. 2. Beyer R. T. Nonlinear acoustics. In Physical Ultrasonics, Academic Press, New York, 1969. 3. Zhang J., Kuhlenschmidt M. S, Dunn F. Influence of structural factors of biological media on the acoustic non linearity parameter B/A. J. Acoust. Soc. Am., 89(1), 1991. 4. Labat V., Remenieras J. P., Bou Matar O., Ouahabi A., Patat F. Harmonic propagation of finite amplitude sound beams : experimental determination of the nonlinearity parameter B/A. Ultrasonics, 38, 2000, p. 292. 5. Saito S. Measurement of the acoustic nonlinearity parameter in liquid media using focused ultrasound. J. Acoust. Soc. Am., 93(1), 1993, 162–172. 6. Lui D. C., Nikoonahad M. Pulse echo measurement using variable amplitude excitation. Ultrasonic symposium Proceedings, Montréal PQ, October 3–6, 1989, p. 1047. 7. Cobb W. N. Finite amplitude method for the determination of the acoustic nonlinearity parameter B/A. J. Acoust. Soc. Am., 73(5), 1983, 1525–1531. 8. Chitnalah A., Kourtiche D., Allies L., Nadi M. Nonlinear ultrasound beam reflection in biological medium. World Congress on Medical Physics and Biomedical Engineering, Nice, September 1997. 9. Chitnalah A., Kourtiche D., Nadi M. Ultrasound nonlinearities: Theoretical and experimental approaches for determining the parameter B/A using reflected wave. Innov. Tech. Bio. et Med., 20(2), 1999, p. 117. 10. Chitnalah A., Kourtiche D., Nadi M. Taking into account diffraction in the measurement of the nonlinear ultrasound parameter. Physical & Chemical News, 7(2002), pp. 71–76. 11. Kourtiche D, Allies L, Chitnalah A., Nadi M. Pulse echo measurement of nonlinear parameter B/A. 8th International Congress of Sound and Vibration (IIAV), Hong Kong, July, 2001. 12. Chitnalah A., Kourtiche D., Allies L., Nadi M. Nonlinear ultrasound parameter measurement in pulse echo mode including diffraction effect. Physical & Chemical News, 26(2005), pp. 27–31. 13. Wen J. J., Breazeale M. A. A diffraction beam field expressed as the superposition of Gaussian beam, J. Acoust. Soc. Am., 83(5), 1988, p. 1762. 14. Makin I. R. S., Averkiou M. A, Hamilton M. F. Second harmonic generation in a sound beam reflected and transmitted at a curved interface. J. Acoust. Soc. Am., 108(4), 2000, p. 1505. Ahmed Chitnalah was born in Taroudannt, Morocco, in 1962. He received the Masters in Metrology, Electronics and Automatic, in 1986, and The Ph.D. degree from Henri Poincare University (UHP, Nancy, France) in 1990. 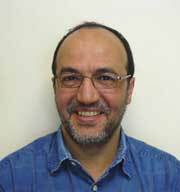 He is currently Professor of Electronics and Instrumentation at the university Cadi Ayyad, Marrakech, Morocco. 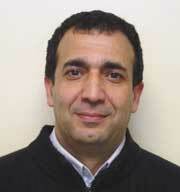 His current research interest includes nonlinear ultrasound propagation, Harmonic imaging and ultrasound measurements. Djilali Kourtiche was born in Sfisef, Algeria, in 1962. He received the Eng. degree in Electrical Engineering from University of Sciences and Technology, Oran, Algeria, in 1985, and The Ph.D. degree from Henri Poincare University (UHP, Nancy, France) in 1991. He is Professor of Electrical Engineering at the university H. Poincaré Nancy France. His current research interest includes nonlinear ultrasound and ultrasound systems modeling. Hicham Jakjoud was born in Marrakech, Morocco, in 1981. He received his Masters in Telecommunication, Instrumentation and Microelectronic at the University Cadi Ayyad of Marrakech, Morocco, in 2005. Since 2005, he is at the Electrical Systems and Telecommunication Laboratory (LSET) as a Ph.D. student. His research interest is modeling nonlinear ultrasound systems and the nonlinear ultrasound method for material characterization. Mustapha Nadi was born in Marrakech, Morocco in 1957. He obtained his Masters in Electronics and Instrumentation at the Henri Poincaré Nancy University in 1985 and his PhD in 1990. He is currently Professor in Electronics and Instrumentation at the University Henri Poincaré of Nancy where he teaches Electronics and Instrumentation for both graduate and undergraduate levels at the Faculty of Sciences. He directed over 25 Master and PhD thesis in Instrumentation and electronics and was also referee or chairman in PhD juries in Europe, Morocco, Canada and France. He is listed as expert in the 6th PCRD European research program and was expert in biomedical technologies and instrumentation for different national or international institutions (WHO, French Foreign Affairs Ministry, AFSSAPS, EDF, European CENELEC). His main research fields concern spectroscopy and non linear ultrasound.